Up to 31% of soldiers returning from combat in Iraq experience depression or post-traumatic stress disorder (PTSD) that affects their jobs, relationships, or home life, according to a new study by Army researchers. MONDAY, JUNE 7 (Health.com) — Up to 31% of soldiers returning from combat in Iraq experience depression or post-traumatic stress disorder (PTSD) that affects their jobs, relationships, or home life, according to a new study by Army researchers. For as many as 14% of these veterans, depression and PTSD cause severe problems in their daily life. These problems are often accompanied by alcohol misuse and aggressive behavior, the study found. "These things begin to snowball," says Robert Bossarte, PhD, an assistant professor of psychiatry at the University of Rochester Medical Center, in Rochester, N.Y. "Your work performance suffers; you experience job loss and economic strain." In extreme cases, the resulting relationship problems and stress can lead to suicide, adds Bossarte, who was not involved in the new study. The researchers analyzed mental health surveys from more than 13,000 Army and National Guard infantrymen who fought in Iraq. The soldiers completed the surveys between 2004 and 2007, three and 12 months after returning to the U.S. 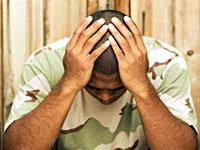 The pre-deployment rate of PTSD and depression among the soldiers was about 3% to 5%, roughly the same as that seen in the population at large, according to the study, which appears in the Archives of General Psychiatry. Roughly half of the soldiers with PTSD or depression reported having abused alcohol or engaged in aggressive behavior, such as punching a wall or getting into a fight. The risk of mental health problems may be more persistent among National Guard soldiers, the study suggests. A greater proportion of men and women in the National Guard than in the Army were diagnosed with PTSD and depression one year after their return, although the two groups had similar rates at the three-month mark. "These were soldiers who were exposed to the same level of combat; who, by and large, reported similar rates of being attacked, ambushed, [and] rocketed; and who reported similar symptoms when they got home,” says the lead author of the study, Major Jeffrey L. Thomas, PhD, the chief of military psychiatry at the Walter Reed Army Institute of Research, in Silver Spring, Md. PTSD is an "immense" problem in returning veterans, says Steven Huberman, PhD, dean of Touro College's School of Social Work, in New York City. Although it's not clear if PTSD is more common in veterans of the wars in Iraq and Afghanistan compared to those who fought in previous conflicts, the current wars have a unique set of circumstances that seem to be contributing to mental health problems, Huberman says. "Since the deployment to Iraq and Afghanistan started about seven years ago, we're seeing a significant difference from other military involvements, in the number and types of injuries, the types of deployments, the nature of the military force, and the impact on families and kids," says Huberman. The study findings suggest that the standard time between deployments, 12 to 18 months, may not be sufficient for many soldiers to recover, and that soldiers with PTSD who are redeployed several times could pose a threat to themselves and to their units, the researchers say. It's unclear why the rates of PTSD and depression among active duty and National Guard soldiers diverged a few months after they returned. One explanation could be that soldiers in the National Guard tend to be more isolated when they get back to the U.S., says Jon Shaw, MD, a retired Army psychiatrist and a professor at the University of Miami's Miller School of Medicine. "Reserve units lose group cohesion and solidarity to a greater degree than those in active units," Dr. Shaw says. "As long as they're involved in active units, they have some kind of group and interpersonal support system. Once they leave the military and go back to civilian life, it's a very tough adjustment." In addition, once they return from duty, reservists stop receiving a government paycheck and need to find another source of income—as well as health care. "Active duty soldiers have uninterrupted free medical care, which is not the case with the National Guard," Thomas says. "After that, reservists can buy into care." Even when the care is free, medical facilities often aren't as easy for National Guard members to access as they are for active duty soldiers still living on military bases, Thomas and his colleagues note. The study highlights the importance of providing appropriate treatment for returning veterans, Dr. Shaw says.